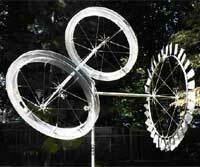 Bill's interview by Matt Petrillo from Philadelphia Weekly "A Spectacle of Squirrel Power"
In a basement workshop, the retired mechanical contractor designs and fabricates these large machines in aluminum and stainless steel. Made for his own amusement they are placed in a secluded area which he calls "backyard in motion". 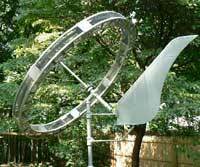 Counter-rotating stainless steel wheels, the largest of which is ten feet in diameter, make up a wind machine, named The Dialectic of Hegel, that has been in place for forty years and, as seen from the street, is a Narberth landmark. Facing into an available air current, however light, it is usually in motion. 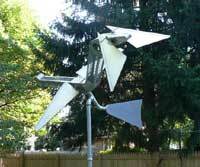 His Avian Anerometer is a bird-driven, wind-driven, corkscrew, merry-go-round. The Squir-Rel-A-Tor, Whirl-A-Squirrel, Swirl-A-Squirrel and Twirl-A-Squirrel are mechanisms by which one squirrel for one peanut will energize an object hundreds of times its weight to whirl, spin and fly. For only one peanut one of these repeatedly rings six large bells, two cymbals, a 30-inch Chinese gong and plays Jane Fonda type exercises. Squirrels visit each machine an average of 150 times a day. That works out to seventeen pounds of peanuts in the shell every week. Yet very little trash is generated. The shells rapidly biodegrade and little residue is evident. Sunlight actuates two other sculptures; Narberth Lite - two rotating columns of beer cans each thirty feet high and DNA-Is-For-The-Birds, a large double helix in which bird feeding cups simulate the interacting molecules. To demonstrate water power, McHugh has fabricated in very large scale a model of the Ringoes Grist Mill with most of its internal works. The original mill was destroyed by a fire in 1939. Based on the interest of passing watchers, McHugh believes the sculptures might have a place outside a nursing home for the diversion of shut-ins. He has extended an offer of free installations to several local facilities.